Fierstein and Fedonchik will add executive firepower during an exciting time in PhotoShelter's thirteen-year trajectory. 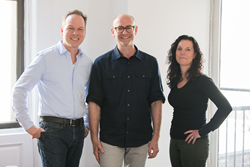 PhotoShelter (http://www.photoshelter.com), the leading digital asset management platform for visual storytellers, today announced two dynamic additions to the company’s executive team: Lisa Fierstein and Scott Fedonchik. Fierstein joins as the Chief Financial Officer and Fedonchik as the Senior Vice President of Marketing. Fierstein and Fedonchik will add executive firepower during an exciting time in the company’s thirteen-year trajectory. Now with 68 employees, PhotoShelter offers two innovative cloud-based technology solutions — a comprehensive business toolset serving over 80,000 professional photographers and Libris, a breakthrough digital asset management platform that helps brands and organizations manage their visual content. Launched in 2015, the Libris platform continues to experience 100% client growth year-over-year. Large organizations using Libris are rapidly realizing that successful audience engagement demands both tools and strategy to centralize, manage, and efficiently distribute their visual content. Fierstein and Fedonchik will be instrumental in the company's expansion and strategic growth as PhotoShelter innovates to serve these needs. Lisa Fierstein, PhotoShelter’s new Chief Financial Officer, has an extensive finance background working with emerging technology and startup companies. In her recent role at Throtle, Fierstein was essential in securing the company’s Series B financing from strategic investors. As the CFO at Plus One Holdings, she oversaw finance through an acquisition by Optum Health. Lisa has also held notable financial leadership roles including the CFO at MetLife Stadium and Zagat. Scott Fedonchik, the new Senior Vice President of Marketing, is an award-winning executive with broad experience developing communications programs across media platforms. He has held marketing and content leadership positions at Rolling Stone, Business Wire, WebMD, and Condé Nast’s Golf Digest group. Over the years, PhotoShelter has been recognized for its business growth and great company culture. Inc. Magazine named PhotoShelter one of the 5,000 fastest growing companies in the United States, and Internet Week has awarded the company for having the "Happiest Employees"​ in New York City and among the 30 Best Places to Work in NYC Tech. PhotoShelter’s mission is to empower effortless visual storytelling. We offer a unified platform of technology, tools, and insights that help more than 80,000 professional photographers and 800 brands manage their visual media every day. PhotoShelter accomplishes this through two solutions: PhotoShelter for photographers and Libris for brands. In 2005, PhotoShelter pioneered the first cloud-based product for professional photographers to showcase, archive and sell their work. It offers beautiful websites, secure storage, plus over 100 features to help photographers take their businesses to the next level. PhotoShelter’s product for creative teams inside brands, Libris, is the simplest and fastest digital asset management platform built for visual media. With Libris, creative teams have easy access to photos and videos so they can engage their audiences anytime, anywhere. Libris is used by hundreds of top brands across industries, including: The Associated Press, Atlanta Braves, Baltimore Ravens, Chick-fil-A, Denver Broncos, Pandora, PBS, Philadelphia Eagles, Politico and Wendy’s.